Rocks are similar to plants in that they have multiple functions, which are to enhance the beauty of a pond while increasing its functionality. They come in different types and shapes and as such can dramatically influence the appearance of a stream or landscape. While selecting and installing a rock may seem like a no brainer, there is actually far more to the process than meets the eye. With an endless variety of rocks to choose from, it is important to remember that rocks are indigenous to the areas in which they form. For instance, the type of rocks that you’ll find in Colorado will be markedly different from those which are present in North Carolina. Using rocks from your local area provides a number of benefits. First, you will dramatically cut down on shipping and handling costs. Rocks tend to be heavy and the greater the distance that they have to be transported, the more you will pay. The second benefit is that the rock will have a texture, color and overall appearance which will complement the pond and surrounding environment. 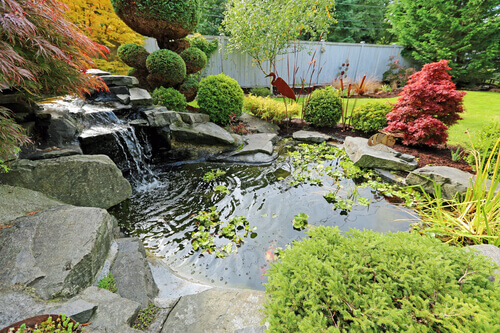 While putting together a diverse collection of rocks in your pond or water garden may sounds like a good idea, it usually isn’t. The better option is a natural appearance which is cohesive and in accordance with the local terrain. When too many rock types are brought together in the same pond it creates a tacky look which is both unattractive and unnatural. It is also important to remember the manner in which rocks tend to influence water features. Rocks provide support to architectural structures, and can also be used to line the base of a pond. When this is done, it will shield the liner from ultraviolet rays, which can be harmful. Furthermore, both rocks as well as gravel provide good microorganisms with an environment where they can thrive. Size is an essential part of rock selection, one that many pond owners don’t pay enough attention to. When selecting rocks it is first important to choose different sizes, small, medium and large. A general rule that professional pond designers follow is the ratio of 1:2:1. This ratio means one smaller rock, 2 parts rocks which are medium in size, and then one part big rock. Choosing different rock sizes is important because you will have correct scaling. Put another way, the bigger stones will look even larger when there are smaller ones that surround it. This will also provide your pond with a look that is more natural. Rocks can often be purchased in a set or collection, and this is the smartest way to acquire them. That way the rocks will all have a similar texture and will appear in various sizes. Think carefully about where the rocks will be installed and be sure the foundation can support their weight.